Hand analysis: Nathan Williams discusses how to play vs. extremely tight players in low stakes games. Fold top two pair? 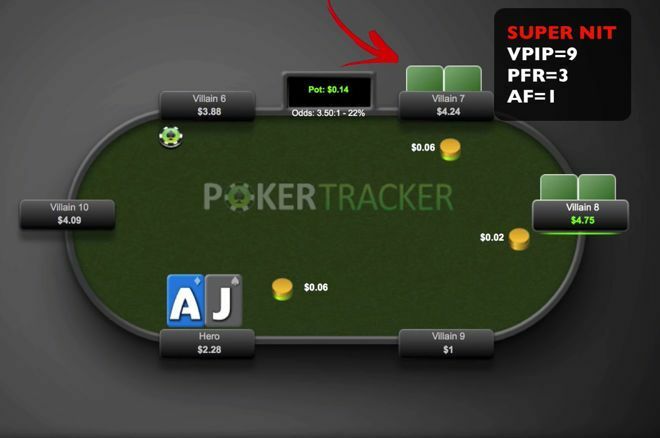 Yes, if your super nit opponent check-raises on the river, says @BlackRainPoker. If you have played any online poker or even live poker at low stakes, then you will have encountered opponents who are extremely tight. You know the type. They fold every hand that's dealt to them for an hour and then all of the sudden they get ultra-aggressive. This is because they have been waiting for a big hand like A-A, K-K, Q-Q or A-K. These kinds of poker players also love to set mine with their small and middle pocket pairs. Overall this is definitely not the most profitable way to play poker, in my opinion. You miss out on tons of highly profitable situations by not getting involved more often. Also, any of the other smart regulars at the poker table are going to notice what you are doing, and they will steal your blinds all day long and force you out of pots after the flop as well. Consistently losing those blinds and other small pots add up in a big way. That's why extremely tight poker players are usually marginal winners at best. We raise 3x preflop with a decent hand, . This is a totally standard open for me from middle position in a 6-max. game. Truthfully though, when I see that there is an extremely tight player left to act in the blinds, I will often raise with several weaker hands as well. Once the tight player or "nit" calls from the small blind and the big blind folds, we go to a flop that gives us top two pair. For me, after he checks this is just a standard value bet situation. I want to make sure that I am getting value from hands like A-Q and A-K which are certainly a big part of a tight player's range when he flats us preflop. I also want to charge any sort of gutshot straight draws he might decide to call with or a stubborn pocket pair like Q-Q. We bet and he calls, then the on the turn doesn't really change anything in this hand given the range we put him on. So when he checks to us again, I agree with the decision just to continue value betting. The river is kind of interesting in that the brings in the backdoor club flush draw. But I really don't expect our opponent to have this very often. This is because versus an extremely tight player like this, there are just so few combos of hands with two clubs he can possibly have. When he checks to us again on the river, then, I agree with the decision to value bet around half-pot. I think this is the perfect amount to get value from hands like A-Q or A-K that just can't seem to find the fold button. However, when an extremely tight player like this check-raises us on the river, this changes absolutely everything. In my experience, having played millions hands at these stakes, an extremely tight poker player like this is bluffing here close to zero percent of the time. In fact I think if we call here he will show us either or a very high percentage of the time. Many people struggle to make the fold here, though. Believe me, I get it. We have top two pair. How can we possibly be beat? But this hand is all about understanding the player type that you are up against and also understanding that tight-passive players like this simply do not check raise rivers as a bluff. But as always I want to know what you think. So let me know in the comments below if you would fold in this situation or are you calling him down? What do you think a tight player like this has here? Do you think he is ever bluffing?